And so it arrives, International Women of Whisky Day, one festival (@spirit_speyside), four events, one venue, and four amazing whisky women! It even had its own twitter hashtag #IWOWD. The venue was the very chic Aberlour Hotel which was laid out wonderfully and who better than to start the day’s proceedings than Canada’s very own Johanne McInnis (@whiskylassie). You can read all about the hows and whys of where the inspiration for this class came from, in our pre festival catch up with Johanne here. I was very excited about this class, Johanne is a good Twitter friend of mine and I couldn’t wait to see her in action, and I certainly was not disappointed. Johanne started the class by giving us all a little background on who she is and what she does. Johanne works in project management but also has a chemistry background (part whisky legend, part geek). Johanne said she had about 30 years whisky experience, firstly drinking and then as a judge for the Canadian Whisky Awards, Johanne also holds her own (numerous) tastings and events and is currently embarking on a massive 9 week long whisky tour of the UK. This would be a very interactive class where we would rely on all of our senses, and we were all encouraged to get involved as much or as little as we wanted, nobody would be forced to speak up (except me, oh and some guy called John with great smelling hands……but more of that later). If you did have something to say though, Johanne was only too happy to stop and listen, to become involved and discuss it further. The class was well structured without structure, ok, so that may not make sense, but if you were there, you would know what it is I am trying to say. It had been well thought out and planned meticulously but Johanne was happy to just let it flow, to really allow it to become something that was magical to us all. Ok enough of the hearts and flowers, let’s get down to the nitty gritty. Johanne had picked five Speyside whiskies (very fitting) and talked about them all in detail, with plenty of personal stories in there too. This was all about the overwhelming choice of whisky out there. If it was your first time into a whisky shop, and you knew nothing about whisky, except that you liked it and you wanted a bottle, then how would you choose which whisky to buy? With this in mind we really explored the idea of packaging. We explored the five “boxes” to see what whisky appealed primarily on packaging. 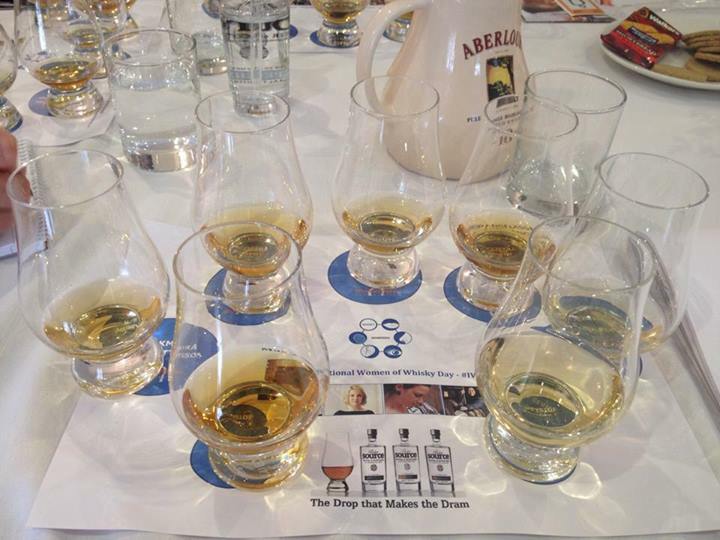 We had Douglas Laing – Scallywag, Glenfarclas – 15yo, Chivas Regal – 18yo, Aberlour – A’Bunadh, Glenrothes – 1988. I have to admit it, I love packaging, it drives Stewart absolutely demented (I apparently should know better, but meh what are you going to do, right? ), for me there is something special in a really nice wooden box with straw, or a sleek, stylish tube, or a big chunky bottle. Now don’t get me wrong, I know this does not make one jot of difference to how said whisky will taste, but it definitely is something that makes me take a closer look at it. The class voted and picked their favourite and that’s the dram we started with (the wonderful Glenrothes, in case you are interested). This is a subject Johanne is very passionate about! Having been brought up around an Italian grandmother, who used to make her smell her food and identify at least one ingredient contained within until she was allowed to eat, Johanne has been training her nose for years! It has been scientifically proven that women are able to identify a far greater range of smells then men. The human nose can detect over 10,000 smells. However the one smell that almost everyone will pick up on is Vanilla, why? Because it is reminiscent of when we all came into the world. Your mother would have emitted a strong vanilla smell, and this is why it’s a smell that is so comforting to people and can evoke the strongest memories. I could write in great detail here of the debates about smell that went on, I won’t, if you want to know more you will need to try and attend one of Johanne’s classes yourself. 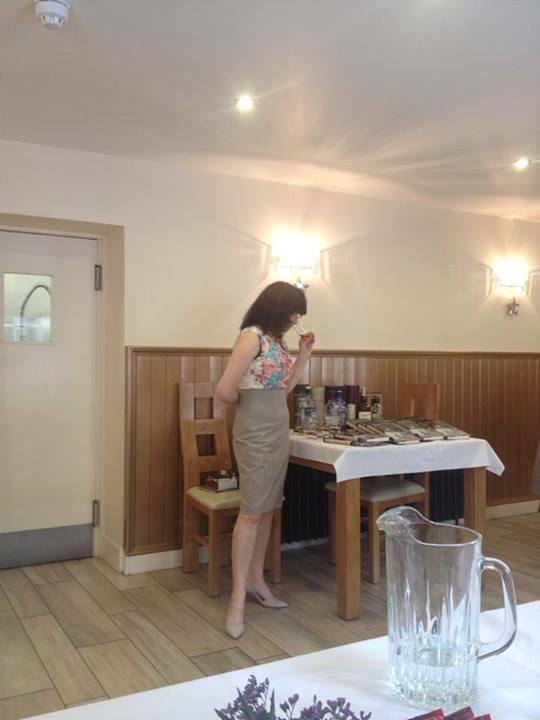 Johanne did explain about the different influences on smell and flavour different casks have and just why that is. Of course the class also studied in depth the smell of a whisky overall. Johanne also likes to nose whisky further by rubbing a little between her hands, the reason for this? It takes out the alcohol and leaves you with the notes of the whisky. Johanne pointed out that the whisky would still different from person to person, apparently it smelt particularly wonderful on a fellow classmate called John, who was a very good sport and let several people smell his hands (I am not making this up, it really did happen, I however, passed on the opportunity to smell John). You may be somewhat surprised to learn that taste is a limited sense, but it is. Johanne explained to the class that most of the notes people detect in whisky come from the nose. There is a test whereby if you get a pinch of cinnamon, hold your nose and then put it on your tongue, you cannot detect the cinnamon (go on, try it). Johanne herself, said that “tasting” whisky is 90% in the nose when she drinks whisky. We explored all of the tastes the mouth can identify, sweet, sour, bitter, salt and the most recent umami (no I didn’t make that up), this taste picks up flavours that are particular savoury like soy sauce, marmite and the such like. We all really thought about taste, what it meant to us, which style of whisky we like and what we really look for in a whisky. It’s very much personal choice, although there are a few “core” notes to pick out depending on what style of whisky you taste. I loved this sense, for Stewart and I it’s one of the best senses and it’s all about the sounds the cork makes when you open it (if you do it right) and then the sound of the bottle as you pour the whisky. I can’t describe it, there just aren’t the words, besides it’s an experience more than anything else. The whole class agreed that it was a sound that just couldn’t be beaten and we all identified with it. 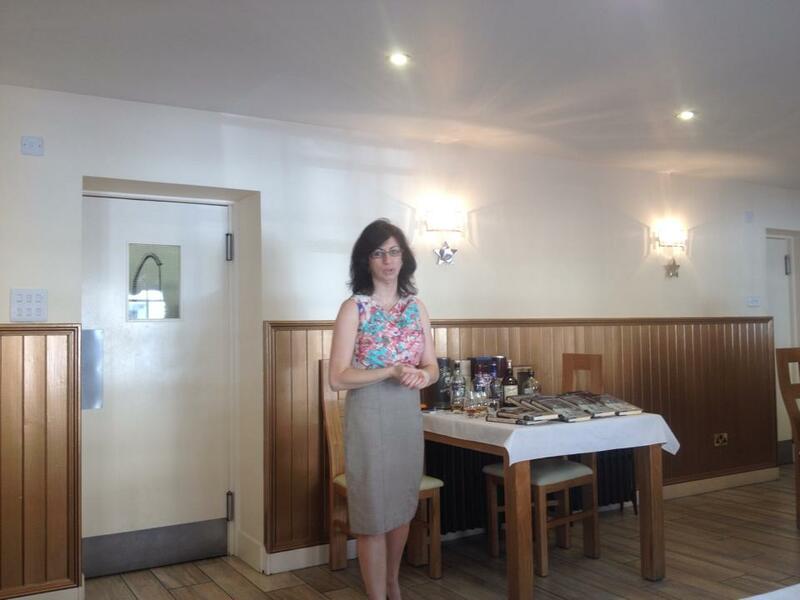 Johanne also spoke about sound and whisky with regards to the lively debates it can often start and about how it can start a conversation off with a complete stranger, just a common interest, merely a drink….only whisky is never merely a drink. Johanne was bounding with enthusiasm and passion for the class and for whisky, more than anything Johanne wanted to convey just how much she enjoyed whisky, learning about it, nosing it, the taste, the science but especially the way it makes you feel, the bonds it makes, the memories it evokes, the friendships that can be borne, all from just one dram. Johanne spoke in great depth and with real passion and feeling about the magic of whisky, and for me that really resonated, it isn’t just a drink, there really is something magical about whisky, be it in its rich history, or the way it can transcend class, gender, race, religion. Think about your favourite perfume, or aftershave, or if you smell someone else’s the memories and emotions that can stir. I love the fact that a dram can transport you anywhere, to any moment in time. 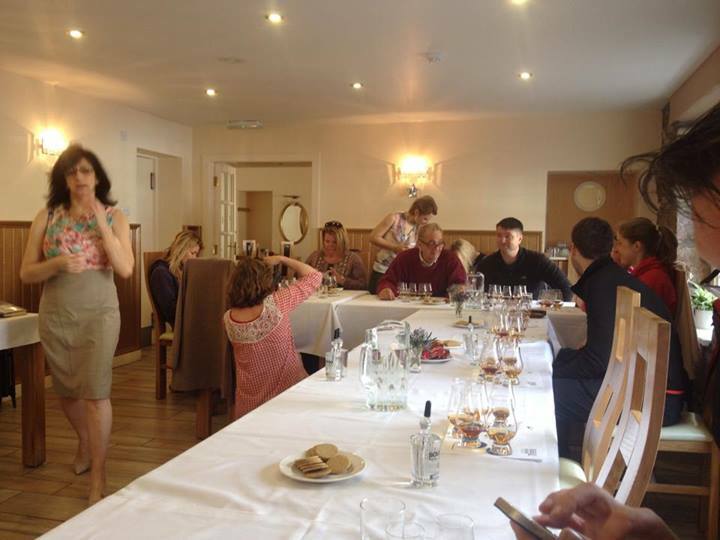 The whole class were enraptured and captivated by Johanne and her enthusiasm, you couldn’t help but be carried away and find yourself lost in the sheer delight Johanne finds in whisky, or caught up in her passion. Hopefully Johanne won’t mind me saying this (too late now) but after the class, she asked me for some feedback and the first thing I said, and it’s still the memory it evokes in me, is that the class was just “her”! This is a very good thing, Johanne just puts so much of herself in it, and for me that’s what made it so special. Yes it was informative, yes there were five amazing whiskies, yes she mocked my “posh” accent and flowery tasting notes (thanks for that!) and yes I learned a thing or two, but more than anything else I went away from that class with just a little bit of Johanne, and I think for everyone else that attended that class they did too! And that my friends, will always be one of my favourite memories.